I'm not able to finish a book lately and I'm a little bit worried about it. It's not that I find them boring or something like that... is just that I like the feeling of starting a new book and I can't avoid it. Last time I went to the library I told myself that I had to go out just with one book, but I arrived home with three... and guess what: I didn't have time to finish any of them. So now I promised myself to finish books, and I started with Franny & Zooey by J.D. Salinger because I started reading it my first day in Gothenburg and it has a special meaning for me, eventhough I just read the first chapter. I'll write more about it and about that day soon. adoro adoro as fotos do teu blog, são amor! Obrigada Catarina! :-) eu adoro as tuas! 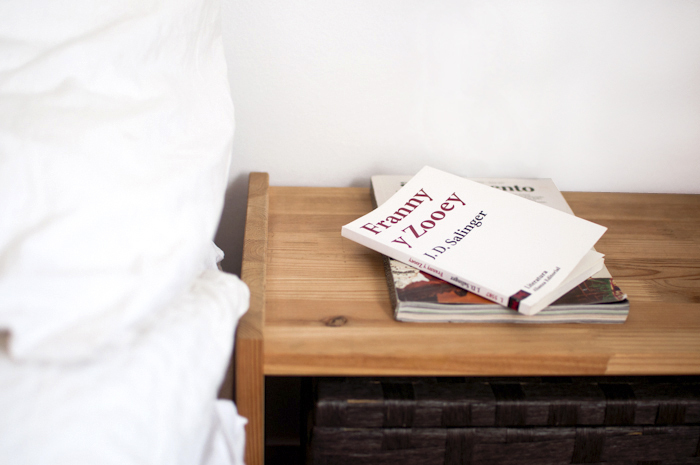 franny & zooey It's a special book for me too, enjoy! Por cierto! Acabo de caer en que habías puesto un tema de Peter Broderick, que maravilla!